NanoSkin AutoScrub Foam Pad will leave you speechless with how well it cleans your exterior in so little time, replacing the need for a clay bar. The new advanced rubber polymer technology removes paint over spray, light water marks, tree sap, rail dust, road grime and other extra stubborn surface contaminants safely and easily. Simply attach the pad to a dual action orbital buffer with a hook and loop backing, spray on a copious amount of the NanoSkin Glide, and start working it in on speeds 1 - 2. You will be amazed at how AutoScrub removes contaminants from the surface in so little time. The advanced rubber polymers safely separate the contaminants bonded to the exterior. You can use this on not only the paint, but the glass, moldings, and plastics. If you ever drop Autoscrub, no worries, it is also a breeze to clean unlike a traditional clay bar. If you ever drop it on the ground, or are simply done with an application, just rinse the pad clean with water and its ready to be used again! You can get about 30 or more applications out of one pad before you need to replace it! There is no need to spend 1 - 3+ hours with a clay bar anymore, with the NANOSKIN AutoScrub Foam Pad get the job done in 15 - 45 minutes! Very simply this is the most effective way to deep clean your paint in a very short period of time. Please note this unit should not be used with a rotary buffer. If you would like to skip using a buffer all together and work with these pads by hand, try using the 6.5" pads with the DI Accessories Hand Strap. The Medium Pads are best used for heavy build ups and the Fine Pads are best for well maintained vehicles. Simply put, they are a must have. In addition to removing contamination quickly and effectively, these pads are extremely easy to use. They can also be used by hand or machine and the different sizes are great for getting in all the tight spaces around a car. This is a wonderful product, which removes surface decontamination times to less than 1/2 with a traditional clay bar. This has now become my go to product for surface decontamination. For a flawless "show room perfect" shine. If inadvertently dropped on shop floor, simply rinse clean. System works fast and achieves professional results with the new advanced rubber polymer technology, which replaces the use of clay bars. With either dual action orbital polisher or hand application, it safely and easily removes paint over spray, water spots, fresh tree sap, rail dust and other bonded surface contaminants from the surface of automotive paint, glass, moldings and plastic. Unlike the clay bar, the AUTOSCRUB can be cleaned by simply rinsing off the accumulated contaminates with water. If you drop the AUTOSCRUB on the ground, no worries, just rinse the sponge pad clean and you're ready to keep using it. Easy glides allows for sturdy and controlled handling, unlike clay bars where constant reshaping is required. To achieve best result on the paint, use with NANOSKIN NAO SHOCK Hydrophobic Spray Lubricant Sealant. For glass prep. and hydrophilic anti-static sealant, use with RAIN PREP Glass Cleaner/Activator then follow with RAIN glass Sealant. Great, best product for paint decontamination. I was very intrigued when I first saw this item for sale, so I had to try it out. All I can say is, WOW. Clay bar has always been a tedious task to complete and takes quite a bit of time and now I will never use one again. 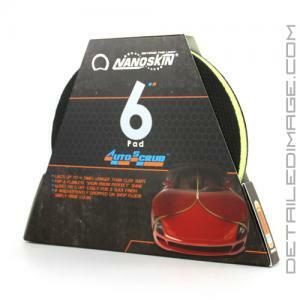 The NanoSkin pad does even better than clay bar, and takes far less time. A quick pass over the car and you can feel and see the difference in the paint. You can even see the dirt that the pad lifts off on the lube on the car! This is an absolute must buy for those who do clay bar to their cars or customers' cars. Bye-bye clay!! I've seen this product out for quite a while now, and I've always been skeptical as to how well it would do. I had concerns of marring from the pad, and using a DA with it seemed like a bad idea. Being a huge fan of the traditional clay I decided to give NanoSkin AutoScrub a try. A client brought me a very distressed Audi S4 in Brilliant Black that was in desperate need of claying. I decided to use the medium AutoScrub pad with NanoSkin Glide to lubricate things and I was completely amazed! Not only was I done within 15 minutes, but the paint surface was silky smooth and eager for paint correction. It had really bad bug stains on the hood and water spots all over. NanoSkin AutoScrub did away with all of these defects without any marring or difficulty. Only time will tell if this product will completely replace paint clay, but I feel that it has tremendous potential in doing so. Try it and you won't be disappointed!